Maybe I should have actually read the dust jacket. The one blurb that I did read about this book did not mention anything about the main character’s journey from our world to a fantasy Tolkien-esque world. If it had, I probably would not have been as jazzed as I was about reading it, nor as let down by The Other Normals as I was. 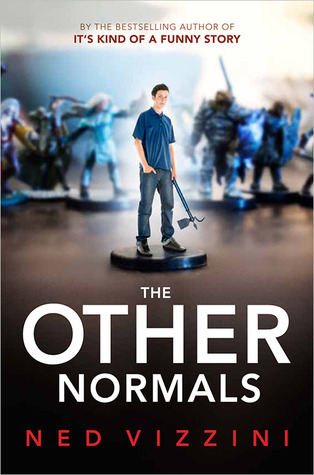 I can say that it is a decent (if predictable) character study of an awkward pubescent teen, and I would not hesitate recommend the book for libraries, it just was not to my own tastes. It is also a fast read (let’s face it, this is really a 200-page book lightly sprinkled over 400 physical pages). The RPG aspect was original and had my interest right from the start, though did not go as far as it could have. I found myself writing a similar book in my head and imagining where I would take it. The dialogue was excellent, and the characters were easy to get to know. Ned Vizzini is a very accessible writer for the YA audience. This entry was posted in Book Reviews and tagged Book Reviews, Fiction, Ned Vizzini, YA. Bookmark the permalink.